What fun David and I have been having. 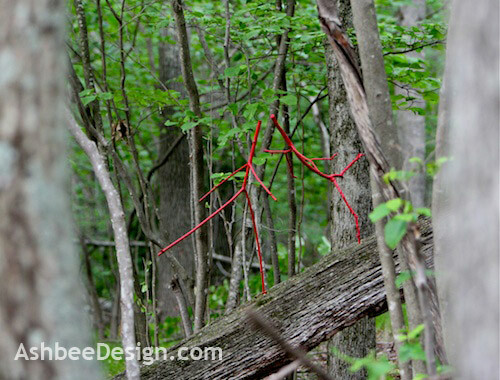 I have posted about my Dancing Red Sticks here and here, and I have posted about our incredible woodland paths here. This week, we combined the two. 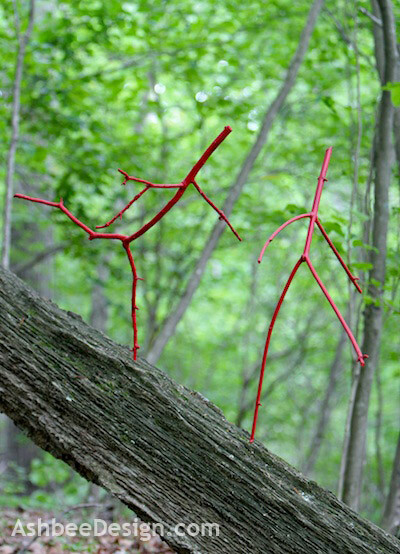 We collected another batch of "dancing sticks" from fallen trees, spray painted them bright red, and have been installing them in hidden scenic glens and forest niches around the area. They are there for walkers to discover and enjoy. Here is a pair of dancers on a leaning tree. Your eyes need to be sharp as you hike by, but there - between the trees you can spot the pair. This is a great project because it is quick with maximum impact. We collected about a dozen figures from tree branches, and because weather threatened, we hung them in the garage to paint. It was definitely a spooky site. We continue to paint them all red, although have discussed other options. The contrast of the complementary colors of red and green in the forest is such a rich combination. 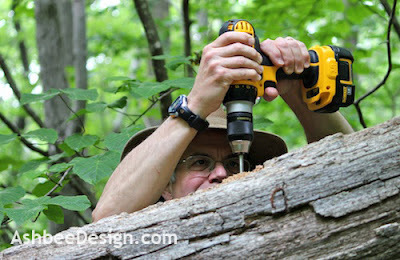 Once dry, we loaded up our arms, grabbed some tools and headed out looking for special spots. We found one on a sun speckled hillside covered in woodland grass. 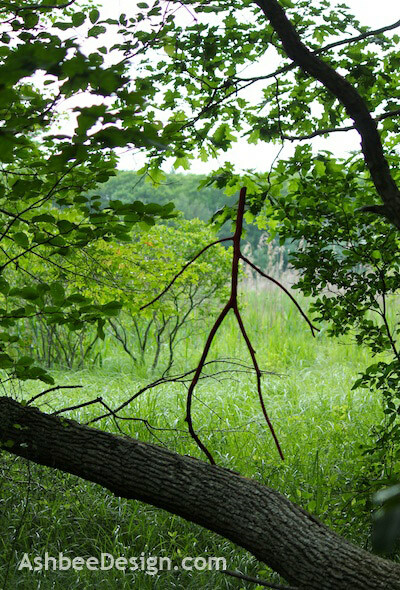 We had left one leg branch longer and just stuck it down into the earth. 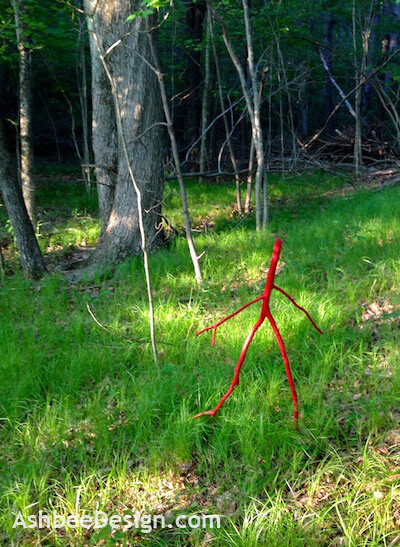 He gives the appearance of skipping through the grass. I wonder if they will be seen or not? Wonder if it will make people smile. I hope so. 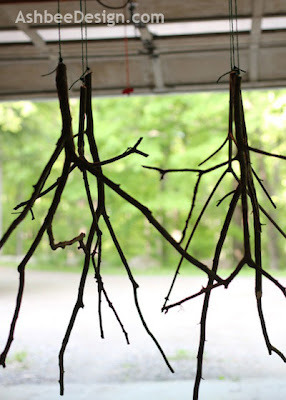 Notes: I posted step-by-step instructions on how to locate and make these dancing sticks in an earlier post. Check it out here. The idea of sharing them with other hikers is new. If you make any, let us know and send pictures! If you find ours, let us know also! Me too! As I wander I am looking up - like a tourist in NYC, only no buildings! These are darling and magical. If I walked along and spotted one, I'd laugh and my heart would be light. Magical is a great word for them! We have people that often leave rock towers and other sculptures behind as they roam. We enjoy the discovery. Thanks for commenting. Magical is a good word but I also like Whimsical for these dancing guys. What a great to find while out on a walk. I love this! Thank you for the smiles and inspiration. Hope you are enjoying your week! Btw, I found you by way of Take It On Tuesday Blog Hop. I live in Connecticut. Spread the concept through out the Florida woods! Send photos. 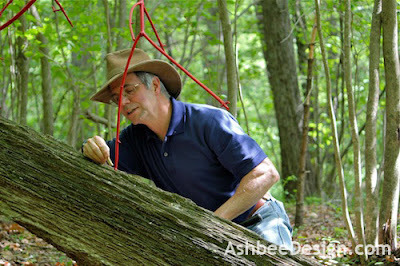 As I have said in the post, this is a quick and easy project. Leaving them in the woods is just fun. Doesn't really matter if folks move them. It is just good to spread the smiles! 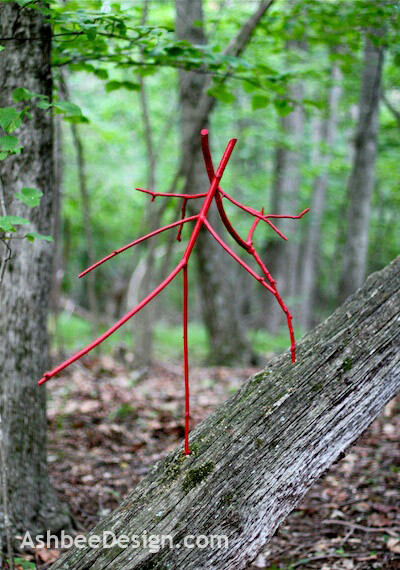 I love these red dancing sticks. I especially love that they are red - I'm sure someone will notice them in the woods. Thanks for sharing this at Romance on a dime! David and I have decided the red is important. I expect yarn bombed might be a good idea as well. They are absolutely whimsical. They just make everyone smile and that is a good thing. Thanks Larry. 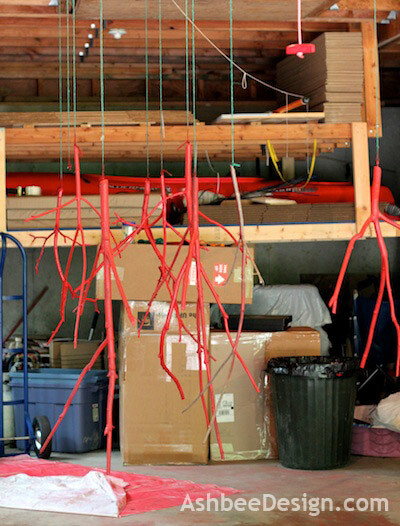 Yes, they are fun, so much so I have another batch drying in the garage right now. We have identified more leaning logs to be decorated.